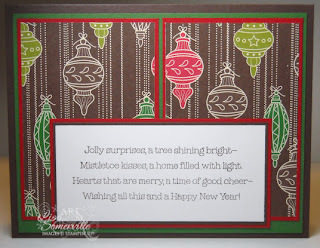 Wanting to get a jump start on more Christmas Ideas, I choose to use the Merry Moments DSP from Stampin' Up! and Many Merry Messages Sentiments. 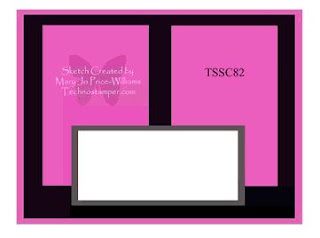 Can't you just see how quick this sketch would be for creating your Christmas cards. A few cuts of your DSP, you'll get a ton of panels, add a few layers, then your stamped sentiment, whoo hooo cards are created in a matter of minutes. All supplies can be found on my website. Great card, nice and easy Christmas card. Love the paper and the sentiment. Oh, I do love this ornament paper and I agree with Kim great Christmas card, easily reproducible. Great job as always, thanks for playing along. This is so adorable!!! Great work!! !